Part 2 covered the “Biggest mistakes to avoid when marketing to the 4 groups” in this final instalment we will cover how to market to the 4 groups. You’ve got to give, give, give, before you get, get, get. You’ll notice I used 3 ‘gives’. Because there are 3 primary strategies. 1. Give an Ethical Bribe! When you market to a Suspect your goal is to turn them into a Prospect. 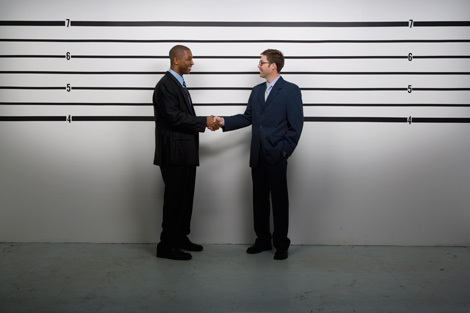 To move a Suspect to a Prospect you ‘give’ an Ethical Bribe. Yes I agree that the two words ethical and bribe put together do seem just a tad contradictory. In this context an Ethical Bribe is about offering some form of incentive or a freebie that you give away in exchange for their contact details and permission to follow-up with them. An Ethical Bribe could be a free report, white paper, or guide. It may be a downloadable eBook, audio, video, app or software. Access to a membership area or VIP section on a website could also be used as an Ethical Bribe. Because of their tangible nature physical products and samples used as ethical bribes may have a higher perceived value. Digital Ethical Bribes have the advantage of being less expensive to duplicate or reproduce. They have no postage and handling costs, and it is much easier to automate their delivery. At the risk of sounding like a cliché the possibilities are endless, and limited only by one’s imagination. Their effectiveness will depend on how well you match them to your target market. To keep costs down you decide to test offering a Free Report as a digital Ethical Bribe. You check with friends and colleagues that the report is easy to read and understand. You confirm with them that the information can be consumed quickly while giving your target market valuable distinctions, insights and clarity. Because you are marketing to just Suspects you set up a landing page on your website that doesn’t try to sell them a new home, it simply sells them on the value of claiming their free report. You keep the opt-in form to just a few fields asking for no more than their name and email address. You make it clear that their privacy is safe and that you will not share their information with anyone else. You set-up a sequential Autoresponder that delivers the free report to them in PDF format via email as either an attachment or a download link. The Autoresponder sequence you’ve created sends personalised emails that provide further valuable information and insights about buying your first home. What was just a Suspect replies to your emails with questions and feedback. You have successfully moved them from Suspect to Prospect. For further ideas on Ethical Bribes be sure to read: Ethical Bribes: 10 Most Effective Client Attraction Device Giveaways by Donna Gunter. When you market to a Prospect your goal is to turn them into a Customer or Client. To move a Prospect to a Customer or Client you demonstrate to them that you can ‘give’ more value. If you get what you pay for then you should be paid for what you give. One can’t expect to be consistently paid top dollar if their products and services are mediocre. The first step to convincing Prospects that your products and services are superior is to actually have superior products and services. At some point the Prospect will evaluate whether or not your product or service is of more value to them than keeping their money. b. Your own concerns about whether or not your products or services can exceed their expectations. When I go to the dentist my concern is pain. The dentist who is concerned about being a ‘Pain Free Dentist’ provides a lot more value to me than one who isn’t. The Pizza Shop that is concerned about my Pizza being delivered steaming hot in less than 30 minutes is of more value to me because they have overcome my concerns about it taking forever and arriving cold. Give more value and you will gain a competitive edge. 3. Give more of yourself! When you market to a Customer or Client your goal is to turn them into a Evangelist or Advocate. To move a Customer or Client to an Evangelist or Advocate you ‘give’ more of yourself. Successful people do all those little things that failures can’t be bothered doing. For years we were fortunate enough to have the best lawn mower man in the country come to our house and mow our lawns. We were very sad when he retired and since then we have never been able to hire a gardener who was as good as him. Why did we consider him to be the best? Was it his lawn mowing skills or the fact that he always left everything immaculate? Yes you read that correctly his secret was ‘dog biscuits’. When I first inquired about his lawn mowing services I mentioned that we had a beautiful new addition to our family… a Boxer puppy named Tara. I explained that Tara had about as much road sense as she was cute and that I was concerned that if she got out she may run onto the road and be hit by a car. He told me not to worry and that he would be sure to keep her safe. A week later I heard the back gate open. Through my office window I could see Tara bounding towards our new lawn mower man. He said: “Hello Tara, how are you?” and then gave her a single, non-negotiable firm command “SIT”. With military precision Tara responded by instantly sitting with perfect form and giving him 100% of her attention. With loving praise he said “good girl Tara” and rewarded her with… you guessed it, a dog biscuit. It was love at first bite. Tara and the best lawn mower man in the country continued their romance and dog biscuit ritual every 2 weeks until he retired and moved interstate some 13 years later. I never had to worry about the welfare of our family pet while he was there. Tara loved him and we loved him for it. Several years later I was on an interstate trip. I walked into a grocery store and heard a familiar voice call out “How’s Tara?”. Smiling I explained to the best lawn mower man in the country that Tara passed away peacefully in our arms at 15 years of age. I told him that certainly was a long innings for a Boxer and that I am convinced it had a lot to do with how much she was loved and just the right quota of dog biscuits. With tears welling in his eyes he wished me all the best and thanked me for hiring him for all those years. I was humbled to be in the presence of the best. Some people just know how to care and give more of themselves. What are the dog biscuits in your business?